Frame constructed of 1" x 1" wooden bars, with wider wood used in arm supports; painted with black enamel and ends of each bar painted in yellow enamel to resemble freshly sawn timbers. Rectangular plywood sheets, painted in brick red enamel, form slanting seat and back supports; framework screwed together. Traces of blue paint under black (may have been repainted early); chair design based on a ten cm. module, approximately three times the width of posts and rails. 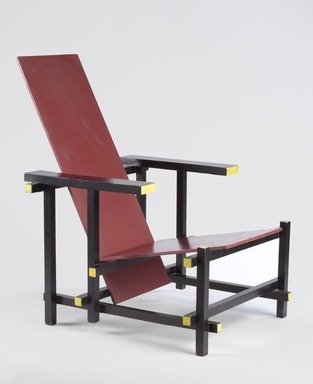 Designer: Gerrit Rietveld (1888-1964) Dutch architect of DeStijl group, was a friend of Mondrian whose later paintings closely resemble forms of this chair. Condition: Good; scratches on reverse side of back support, scattered small nicks in paint.